Make Your Own Laundry Detergents, Stain Removers, Pre-Wash Sprays and More! HomeFrugal LivingHouseholdMake Your Own Laundry Detergents, Stain Removers, Pre-Wash Sprays and More! Why spend oodles of cash on the laundry? You can easily Make Your Own Laundry Detergents, Stain Removers, Pre-Wash Sprays and More! These simple money saving recipes can literally save you hundreds of dollars per year. Fels vs. Zote– which works best? Super Laundry Sauce Frequently Asked Questions- here are all the answers to all of your questions regarding this recipe in 1 spot! Are You Brushing your dog’s teeth? i just joined the site and mixed up my very first batch of super laundry sauce original recipe. i followed the directions exactly and now i’m just waiting for the 4 hours to pass. So far all has gone well. i made the laundry sauce and love it! it was easy and works great! when i washed the bedding in my granddaughter’s sleepover bed she asked how i got the sheets and blankets so soft!! it is awesome and fun and again, super easy!!! does anyone know what to do if the laundry soap does not dissolve. i poured all the soap into the boiling fels naptha at once, now all i have is thick powder. no liquid. Not sure why it didn’t melt. How long was it on the stove and you stirring it. is there a recipe for liquid dish soap? i plan to save lots of money with my super laundry sauce! it is wonderful and so easy & cheap to make! my husband has always had to have a special type of tide because of his allergies but this sauce (detergent) works for him and his allergies! can you use essential oils to add different scents? Just finished some powdered detergent as I didn’t find any liquids I liked. This sounds like a winner and will make. will this work in hd washing machines? i love the powdered myo laundry soap (i use irish spring soap because im allergic to ivory), my only complaint is that pet hair seems to stick to everything (my aussie and golden shep/collie mix should be bald by now..which would solve the problem.. lol) has anyone else noticed this problem? if so..
what did you do to improve? there’s nothing in the soap that will harm the uniforms, in fact, this is one of the mildest ones i’ve ever used. most of the ingredients are found in other soaps but this recipe leaves out the detergents and salts that would harm uniform fabrics. will these recipes be ok in the front loader he machines? yes, i use this in our front loader all the time! the only difference is that you need to put the laundry sauce on a piece of laundry to get it into the washing machine. don’t put it down through the detergent dispensers as it could clog them. i haven’t had any problems at all, and everyone loves the scent! i have just started more jars, a few minutes ago. doesn’t hurt to stock up! in the directions for the laundry sauce it says all you need is one tablespoon of sauce but how did you come up w that measurement? is there an equivalent bar of soap besides the fels napta because i cannot seem to find that here in canada. we have sunlight and linda bars of laundry soap. can i just throw all of it in a kitchen ninja and throw the switch? lol also, i have twins who work in fast food kitchens and come home covered in “grease”! it doesn’t seem to matter what i put in the washer nor what temp. i use, they come out still feeling/looking greasy. does anyone have any suggestions for washing their uniforms? i love this site!!! Is there an equivalent bar of soap besides the Fels Napta because I cannot seem to find that here in Canada. We have Sunlight and Linda bars of laundry soap. Can I just throw all of it in a Kitchen Ninja and throw the switch? lol Also, I have twins who work in fast food kitchens and come home covered in “grease”! It doesn’t seem to matter what I put in the washer nor what temp. I use, they come out still feeling/looking greasy. Does anyone have any suggestions for washing their uniforms? I LOVE THIS SITE!!! the first time i made this recipe and living in canada i substituted a sunlight bar. the only thing is to note the difference in size. fels napta is 150 gm while the Sunlight is 120 gm. So I just used a kitchen scale and kept adding shavings off of a second bar until I had the right amount and the soap was fantastic. I have made it with both now and I found no difference. i would try soaking them in dishwashing liquid, preferably dawn, for at least 30 minutes, longer if possible. My husband is a truck driver and often gets that black grease on his clothes. I use either a bucket or the kitchen sink. I usually rub the fabric against itself, wring out, rinse once, throw in washer. Another option would be to do a borax pre-soak in your machine. i have been using the super laundry sauce for a while now. it works great and i used to use tide. im not saving much money though because i have been keeping my daughter in law and mother in law supplied. i can’t wait, i have to try my laundry detergent now!!! i love the laundry sauce, i washed my sheets yesterday and hung them out. they smell great, no heavy detergent smell. I was planning on making the liquid laundry soap in the next few days. After talking with a friend who has made the dry version, I’m not so sure I want to. She said it ruined several family members’ machines. It apparently got it all “gummed up”. Has anyone had any problems with the liquid version? Thanks in advance. I was planning on making the liquid laundry soap in the next few days. After talking with a friend who has made the dry version, I’m not so sure I want to. She said it ruined several family members’ machines. It apparently got it all “gummed up”. Has anyone had any problems with the liquid version? Thanks in advance. Well, I can honestly say I’ve been using this homemade detergent for almost 2 years and I’ve never had a single issue with it “gumming” up my machine. all of the ingredients are meant to do laundry, so i’d say the people experiencing the issues probably are using it wrong- like using quadruple the amount needed, etc. it really sounds like complete bs to me. Thanks Burkett…. I’m going to give it a shot since I’ve heard so many good things about it from this site. Hopefully, this week I’ll find the time to get it done! Maybe I’m doing too much reading!! Another individual saying it was very costly to use this detergent as it cause them numerous problems with their septic (which I am on as well). She said the Fels will kill of the bacteria and keep it from breaking down like it’s supposed to. Anyone here have any experience with the homemade detergent being used on a septic? Thanks in advance! Purchased all the items so would REALLY hat to not be able to use them! all 3 of the Ingredients in the homemade safe are considered safe for septic. Think of it this way, you’re using a single bar of Fels to do 128 Loads of laundry… it’s Highly diluted with multiple gallons of water. That persons post is complete and utter garbage and should be removed from the comments completely. :deadhorse: Chances are she dumps grease, feminine products, etc down her drain and that’s the cause of her issues. We literally pump our septic tank once every 15 years and I’ve used a blend of fels, borax and washing soda exclusively for the past 18 years with Zero problems. If you’re concerned about it, Contact Purex directly and ASK them- Since they’ve been selling this Product for Use in Laundry for the past 100 Years, I highly doubt it’s an issue. Wow, wow, WOW!!! 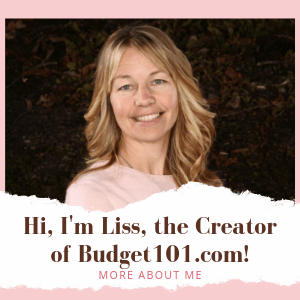 I’ve just joined Budget101 and this is the first thread I’ve read–such great info!! ty everyone for sharing your ideas and experiences! Thank you so much for posting. What a great help it is. I printed it out,put it in a protective sleeve and hung it in the laundry.